St. Thomas and Nova have played some memorable nail-biters in the long history of their rivalry. As recently as last season, the teams played an epic 12-inning 8A regional championship game, which Nova eventually won 4-3. On Wednesday night, the teams were back at it again in front of a packed house in this years version of the regional final. 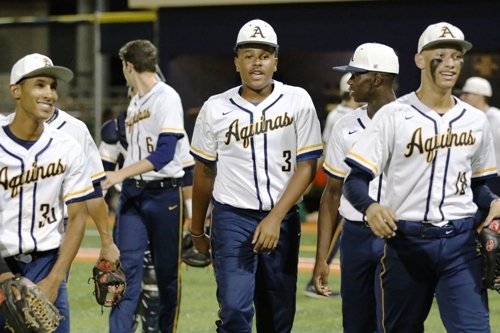 Unlike last season, there would be no drama, as St. Thomas, one of the most consistent teams in Broward all season, again showed why they are among the states best, pounding out three home runs en route to a 10-1 win. “I actually thought our approaches were a bit off early in the game, but then we settled in and did what we have been doing all season, which is square some balls up and score a bunch of runs,” said St. Thomas Manager Troy Cameron. The Raiders took advantage early of the fact that Nova was without their ace, Trace Moore in this one. Moore had thrown the regional semifinal on Monday, and was unable to pitch Wednesday due to state pitch count rules. Asdin Santiago was given the ball for the Titans, and the Raiders offense was up to the task. Cade Fergus put Aquinas on the board with a solo home run in the bottom of the first. The Raiders addeda run in the second, making the score 2-0. In the third, Nova finally got to St. Thomas ace Blake Hely. A Jordan Campbell single cut the lead to 2-1. But in the bottom of the third, after a Fergus walk, Raiders catcher Caleb Roberts, who led the team this season in average (.500), on-base percentage (.585), home runs (6), and RBIs (49), continued his torrid year at the plate with a two run blast, putting the Raiders up 4-1. 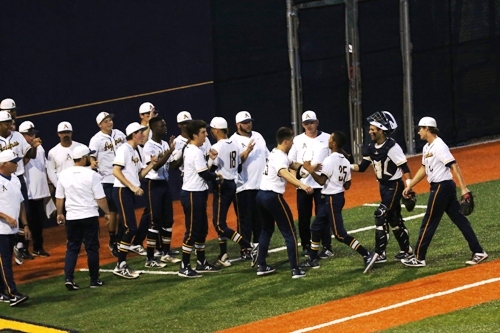 While Roberts home run provided the Raiders some breathing room, it was a play in the next half inning that changed the complexion of what was headed towards a tight game. With one out, Jaden James was hit by a pitch. Campbell then doubled, and after a strikeout, Jeff Cardazzone was hit by a pitch, loading the bases. Isaiah Goodman then drilled a ball that appeared to be heading over the head of Gabe Terry. 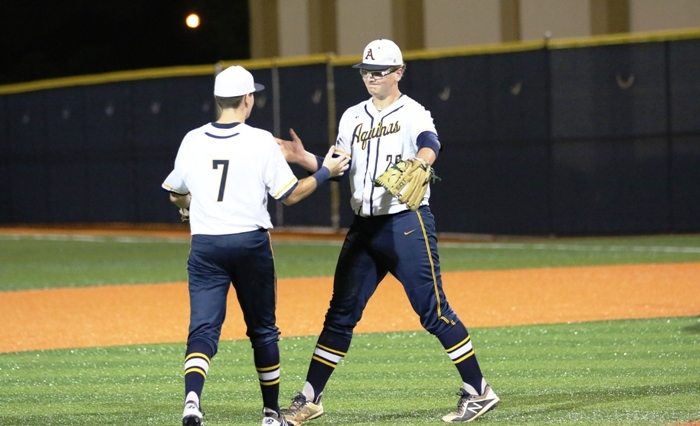 The right-fielder, however, caught up with the ball and made a highlight reel over the shoulder catch, ending the inning and the last real threat the Titans would have on the night. With imminent danger behind them, Hely then settled down on the mound, and the Raiders put the game away in the fifth, sending 10 batters to the plate, and scoring five runs. Hely, who has an ERA of 0.69 this season, went 5.1 innings, allowing only three hits and one run. The Titans finish their season 22-4, and will begin preparing for next season, while the Raiders are on to the state final four for the first time since 2013. After the win Tuesday, there was no celebration from Aquinas players, as they quickly lined up to shake hands with Nova after the final out. St. Thomas will have no easy task in their quest for that elusive state ring. Up next on Friday, June 1st, is a date with Tampa’s George Jenkins, widely considered one of the top teams in the state.